1 onion, 1 tomato, 1 clove garlic, paprika. Put a pot (casserole) with water groping for soup or (25 cups water), cut the chicken in pieces and put it to cook until the chicken is almost ready, then saute onion tomato garlic and paprika and use the dye to add color. Place all that into the pot where the chicken is cooking. Simmer about 10 minutes, add rice (plain) with green banana cut into rectangular shapes. Wait until the rice is cooked and turn it off, while putting the 6 eggs (without stirring), add oregano 5 minutes before serving. And cassava put to cook separately (as Jacuú) and serve on the side. You can also eat with Bolivian spice called llajwa, it is made of locoto [Capsicum pubescens], mixed with tomate, some salt and sometimes herbs are added. 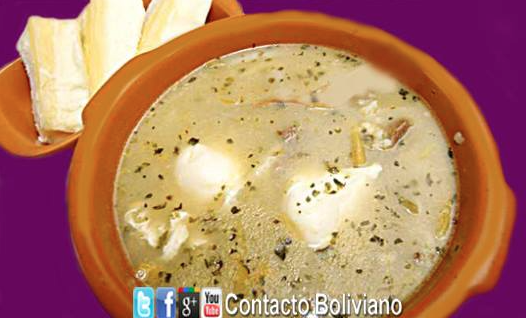 This entry was posted in Bolivia, Holidays, Santa Cruz, Tourism and tagged Bolivian cuisine, bolivian food. Bookmark the permalink.